EXECUTIVE DIRECTOR MESSAGE: GLOBAL UNIVERSITY INVESTS IN WOMEN. APPLY BY FEB. 11! I am a passionate outdoor educator, fearless adventurer, and tireless advocate. I also happen to have a superpower: I am a woman. However, it took me a long time to feel confident in saying this. When I started out in my career, I encountered numerous obstacles as a woman, and I’m sure many others in the field did as well. When the road to success got rocky, I often longed for the support, time-tested insights, and comradery of other women. But unfortunately at the time, these resources came in limited supply. This dynamic has slowly changed thanks to the collective efforts of countless pioneering women and now, we are seeing more opportunities for connection and role modelling. Research backs this up, showing that mentorship is one of the most critical factors in helping women succeed in outdoor recreation and education (Fochtman, 2010; Jordan, 1992). As AORE’s executive director, I am proud of how our organization has contributed to this important shift in awareness through its mentoring program, where one of our main priorities is to connect and empower women in outdoor leadership. And we not only seek to promote gender equity, but also know that making space for diverse perspectives and leadership styles will have a lasting positive impact on student learning outcomes within the programs we deliver. This year, AORE continues to dream big and go forth boldly into the world to achieve these goals. Check out our full article on AORE’s Global University program, which will offer an immersive outdoor leadership experience exclusively to women in 2019. 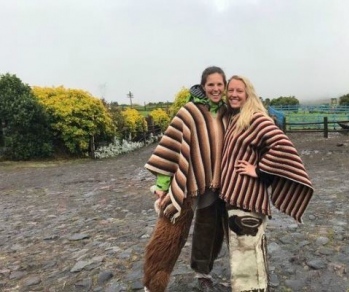 Thanks to the generosity of our partner, G Adventures, this expedition is available at a fraction of the cost to ensure that women of all backgrounds can access the same opportunities for personal growth and connection. I can think of no better way to learn. Applications must be submitted by Feb. 11th before 11:29 pm PST. As a mother of two kids, Gretel (13) and Thor (10), my mission of advancing the next generation of women leaders is even closer to my heart. I hope you will consider joining us in Costa Rica this May as we work to shape the future of our industry. When women come together, anything is possible!